One of the Bay area’s best music festivals, The 13th Annual Outsound New Music Summit, July 27–August 2, 2014, returns to the Community Music Center at 544 Capp Street in San Francisco. The New Music Summit is co-presented by KFJC 89.7 FM. 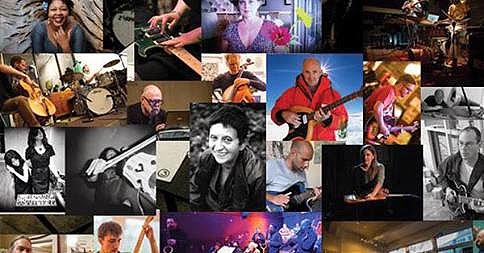 Featured during the annual festival will be poets collaborating with unique electro-acoustic settings; a night of experimental guitar solos and duos; a cue-led improvising orchestra, vocal and student workshops, the “Touch the Gear” Expo and acoustic/electric ensembles pushing the edge of sound. Sixteen performances will take place throughout the week, and will include the first poet to experiment with jazz, Ruth Weiss. Dubbed by writer Herb Caen as “the goddess of the beat generation,” Ruth will collaborate with buchla synthesis pioneer Doug Lynner. The Summit will also feature world premieres by the Emergency String (X)tet, the Deconstruction Orchestra; Pitta of the Mind; the world-renowned Henry Kaiser; and the Teddy Rankin-Parker/Daniel Pearce Duo performing new works by Renee Baker. The Festival begins on Sunday, July 27 at 2 pm with a music improvisation workshop for all levels led by pianist, composer, and educator, Thollem McDonas, followed in the early evening by the popular and free Touch the Gear Expo from 7-10 pm. A hands-on experience with sound-producing gear and instruments, Touch the Gear is an interactive, family-friendly event that allows the public to roam among 25-30 musicians and instrument inventors with their various different configurations of “gear”—everything from oscillators and electronics, to planks of wood with strings attached. An avant-garde “Maker’s Faire,” all attendees get to make sound and experience how the instruments work, in an environment that demystifies technology, while inspiring creativity. This event is free to the public. Monday, July 28 at 8 pm, Thollem McDonas and participants, (including yours truly), from the Sunday improvisation workshop will perform a set of structured and free improvisation. This event is free to the public. On Wednesday, July 30 beginning at 8:15 pm, the New Music Summit presents a night of spoken word and poetry with electro-acoustic music, dubbed PoetryFreqs, featuring Pitta of the Mind (Maw Shein Win and Amanda Chaudhary); one of the first American jazz beat poets ruth weiss with electronic pioneer Doug Lynner; the debut of Watkins/Trammel/McZeal (Zachary James Watkins, and Marshall Trammell) with award winning poet Amber McZeal which will run the gamut from bebop to soundscapes. Thursday, July 31 at 8:15 pm will showcase six talented and provocative guitarists in a program simple entitled Guitars. The four sets, presented by Henry Kaiser, Amy Reed & Ross Hammond, Noah Phillips & John Finkbeiner, and Sandy Ewen & Jakob Pek, will stretch the limits of the instrument crossing the borders of electronics to found objects and everything in between. Friday, August 1 at 8:15 pm will bring two extremes together in a program entitled Constructions, with the Teddy Rankin-Parker/Daniel Pearce Duo, premiering new works by renowned composer Renee Baker, commissioned by RPPD specifically for the Outsound Summit. The Deconstruction Orchestra, a mass ensemble of 25 leading Bay Area improvising musicians led by tenor saxophonist and composer Joshua Allen, who will perform the debut of The Structure of Sound and Space, an original deconstructivist-inspired suite of cell structure game compositions, melding together post-modern, free jazz and non-idiomatic improvisation. The final day of the Outsound New Music Summit, Saturday, August 2, will present an afternoon vocal workshop with bodywork/energywork master Jill Burton entitled Transformational Voiceat 1 pm. Later that evening, beginning at 8:15 pm will be the program Improvisations, featuring three different groups of improvisers exploring the language of the unknown—Obstreperous Doves (Karl Evangelista, Bill Noertker, Nava Dunkelman, Christina Stanley, and Jordan Glenn); Emergency String (X)tet (Mia Bella D’Augelli, Jeff Hobbs, Christina Stanley, David Michalak, Doug Carroll, Kanoko Nishi-Smith, and Bob Marsh), who will premiere a new work in celebration of Bob Marsh’s 70th birthday; and the Jill Burton Trio (Jill Burton, Tim Perkis, and Doug Carroll) who will be collaborating for the first time. For event details including the list of performers, biographies and information about the 2014 Outsound New Music Summit, visit www.outsound.org/summit. Artists and schedule subject to change. July 30: PoetryFreqs: $15 general, and $12 students/seniors. July 31: Guitars: $15 general, and $12 students/seniors. August 1: Constructions$15 general, and $12 students/seniors. August 2: Improvisations: $15 general, and $12 students/seniors.